The Mumbles Coastguard Rescue Team is part of the U.K.'s H.M. Coastguard Rescue Service, the volunteer wing of Her Majesty's Coastguard, an Agency of the U.K.'s Department of Transport. The team is made up from 15 local volunteers who are fully trained and able to respond, 24Hrs a day, every day, to Maritime and Coastal emergencies. The Team can also be called upon to assist our Emergency Service Partners. In 1809 the Preventative Water Guard was established and can be regarded as the immediate ancestor of HM Coastguard. Its primary objective was to prevent smuggling, but it was also responsible for giving assistance to shipwrecks. Each Water Guard station was issued with Manby’s Mortar, which was invented by Captain George William Manby. The mortar fired a shot with a line attached from the shore to the wrecked ship and was used for many years. In 1821 a committee of enquiry recommended that responsibility for the Preventative Water Guard be transferred to the Board of Customs. The Treasury agreed, and in a Minute dated 15 January 1822, directed that the preventative services, which consisted of the Preventative Water Guard, cruisers, and Riding Officers should be placed under the authority of the Board of Customs and in future should be named the Coast Guard. The Mumbles Rescue Station was originally located at Westboune Place, Mumbles and had a Drill Square, Offices and four Family homes. The station was upgraded in the early 1870s. The Station had been operational since before 1840. Officers worked shifts, manning the Lookout at Tutt Head and keeping a constant watch over the Channel. Duties included monitoring Ship Movements for Lloyds of London. They also carried out Rescues when not on Watch. The Rescue Equipment being housed in the Garage that used to be at the top of Park Street, at the end of Westbourne Place. In the event of an emergency, the Station Officer would fire the maroon rockets at the Rescue Station, but had to go and let everyone in the homes know first! Her Majesty's Coastguard became a government executive agency in the 1990's, and then combined with the Marine Safety Agency in 1998 to become the Maritime and Coastguard Agency (MCA). The Initiation, coordination, mobilisation, organisation and tasking of adequate resources to persons at risk of injury or death at sea, on the cliffs and coastline of the United Kingdom. The U.K. Search & Rescue Region is over 1.25 million square nautical miles of sea and over 10,500 nautical miles of coastline. 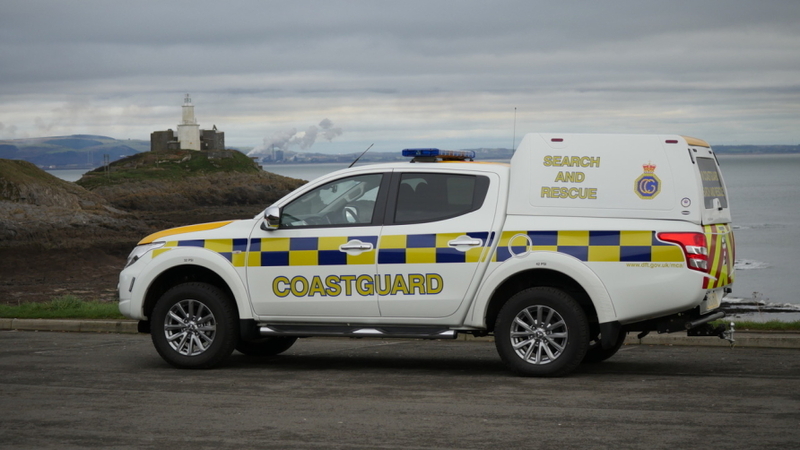 H.M. Coastguard is the only National Emergency Service. The C.R.S. consists of around 3500 officers in 362 teams strategically placed around the coast. The teams are arranged in Sectors and each Sector is managed by a full time Coastguard known as the Sector Manager. 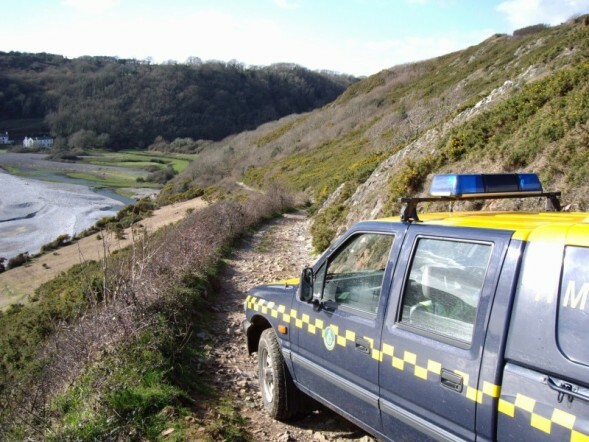 In the Gower Sector there are 6 Rescue Teams and about 64 Officers in total. Other Sectors may have more or less Officers depending on the local arrangements, coastline, islands etc. The Mumbles Coastguard Rescue Team is made up of 15 Volunteers with a Station Officer and Deputy Station Officer responsible for day to day operations. The Team's members are entitled "Coastguard Rescue Officers" or CROs for short. Each Officer is fully trained in the standard Coastguard procedures of Land Search management, Communications Helicopter Operations, Pyrotechnics and First Aid. CROs are also fully trained in any specialised rescue techinques that their team are required to operate. The Mumbles team are a specialist Rope Rescue Team and are equipped with the latest Rescue equipment to rescue people from heights. Depending on the emergency, the Mumbles Team may be called to assist any other team in the Gower Sector or further afield as H.M. Coastguard are Category 1 responders, assisting our Emergency Service Partners (Police, Ambulance Service, Fire Service etc) . The team has been despatched to many inland incidents including the Gloucester floods and Glanrhyd Train disaster as well as dealing with snow, ice and local flooding.